What Does Luggage Warranty Cover? It is a good idea to check the manufacturers' luggage warranty before buying any luggage. The covers tend to be similar but the warranty periods can vary greatly. The most common luggage warranties are between 3 to 10 years but some bags come with lifetime warranty. The luggage retailer may also offer some luggage guarantees, e.g. low price guarantees, no question asked return policy, etc. It is advisable to check this prior to making your purchase. You usually have to present proof of purchase with store receipt to claim luggage repair under warranty. 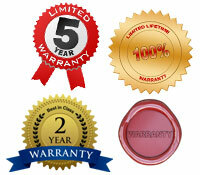 Always keep the warranty certificate in a safe place and it is good to keep the product tags as well. Some luggage manufactures also require you to register your warranty with them. Failure to do so may void the warranty. What Does Luggage Warranty Include? Is the shipping cost (to and from the repair center) included or not? Is damage done by your carrier (e.g. airline) covered or not? Is damage caused by you abusing / mishandling the product covered or not? Is the warranty only valid for the first purchaser or gift recipient of the product (i.e. cannot be transferred or sold to another owner)? What Does Luggage Warranty Exclude? Luggage warranties are not insurance so they never cover lost or stolen luggage. In addition, the luggage manufacturer cannot be held responsible for any damage to the content, loss of time or use, or any other consequential or incidental damages. Most luggage manufactures require you to use only authorized or official company repair centers, i.e. you cannot take your bag to any luggage repair center. Always check with the manufacture prior to taking your luggage to be repaired. Improper or incorrectly performed luggage repair or maintenance can void some manufacturers' warranty. Luggage warranties usually exclude cosmetic wear and tear (including on moving parts like wheels and component parts). They also exclude any cleaning. Some warranties also exclude any misuse, neglect, abrasion, accidents, exposure to extreme temperatures, solvents, water, acids, transport damage, etc. Always read the small print. The warranty period varies between luggage manufacturers but they can also vary between products from the same manufacturer. As said before, the most common luggage warranties are between 3 to 10 years but some manufacturers are so confident about their luggage quality that they offer unlimited or lifetime warranties (some on selected products only). The rule of thumb is: the higher quality product, the longer the warranty period (and higher the price). Always check the manufacturer's warranty before buying your luggage. The covers tend to be similar as you can see in our warranty comparison table, which compares the luggage warranties of some of the best know luggage brands. The No Matter What™ Warranty covers the Lifetime Warranty promise plus the added insurance of repair or replacement due to damage, regardless of the cause. Remember, luggage warranty is a lot like insurance so always thoroughly read the small print.